The location was just West of Raton, New Mexico. The time of year was early September. 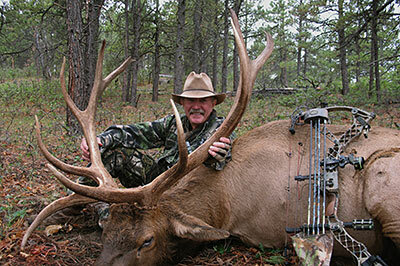 The hunt was elk hunting to collect footage for Hunter specialties TV show and DVD series. I arrived at the Bar 5 Ranch early Thursday morning trying to give myself enough time to get things put together before it got too dark to go out for an afternoon hunt. Myself and two camera men went to a canyon where I had seen a lot of sign during Spring Turkey season. It did not take long to hear elk bugling. My first time out of the truck while using the new elk calls that I had designed numerous Bulls bugled back to our high pitch cow calls. Before we could go 200 yards a bull that we thought was across a draw from us was actually standing 20 yards behind us only to see us and run away. However, during the few minutes we were calling to the one that got so close, there was another bull bugling about a half-mile down the canyon. He had the type of sounding bugle that you would walk half a mile down the canyon to get to. The wind was perfect. So we made our way down closer to what sounded like a good bull, set up in 20 foot tall Oak brush. It wasn’t long and we could see legs and antlers making way to our position. He came within 40 yards but not quite broadside to take a good shot. He didn’t run away but he knew something was not right and walk away. The next morning I sent the rest of the hunters to their area and went to the same area where I had been the night before. It was just after daylight, it had been raining lightly so walking in the woods was quiet with one exception, elk were bugling everywhere. We stayed up high on a ridge until the wind got right, then work our way towards the bull that was now bugling like crazy but not moving very much. When I set up I had two options, set up in a really thick area, or move out in the open where we get better footage. I chose setting up in the open. Within five minutes I saw the tips of big antlers coming up over the hill in front of us, a little to my left , bugling like crazy but not a good shot. After a minute or so, he turned to leave, I bugled hard using a double reed diaphragm call trying to imitate the challenge of a young adolescent bull. Sure enough, it worked like a charm. He turned and started coming to my right going through some brush that would offer me an opening for a broadside shot at 30 yards. I knew the camera was running and was on him since there was not much cover. I took the shot as soon as I had the opportunity. Fortunately the shot was dead center with a complete pass through. It is great to hear an elk fall down within 40 yards. I love it plus it saves on difficult tracking. During the same time one of the of the other hunters had called in numerous bulls and had taken a nice 5 x 5 only to have a 300+ come within 30 yards. The next day one of the other hunters killed the largest bull that was taken on the hunt scoring in the range of 340. Our fourth hunter called in seven shooter bulls during the four days that he hunted. Unfortunately his set ups did not provide for a good shot. In four days of hunting we were in elk continuously every day. Between the four hunters I would say we called in at least 20 bulls. We also got some of the best elk footage you could imagine. The bull that I took on the first day of the hunt scored a little over 300. We never hunted the entire ranch, only the north side, but that was still enough to get the job done. The Bar 5 Ranch is one of the few places that I have gone that I really just wanted to stay. It is absolutely beautiful with a bear running at every corner, elk bugling, turkeys gobbling in the spring as well as in the fall, and plus there are some 200 inch mule deer. Using a score of 1 to 10 (10 being the highest) this ranch is 10 big time. If you are reading this and are interested in a great hunt with a lot of animals that live in easily accessible habitat this is the place; easy to get to and only 45 minutes outside of Raton. I do not think you’ll be disappointed.